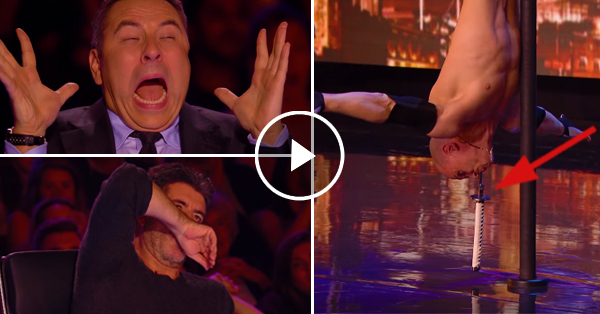 This man simply stepped on-stage, but when he started performing the judges' minds were blown! Home / Unbelievable / This man simply stepped on-stage, but when he started performing the judges' minds were blown! The Got Talent franchise is spread out all over the world. They only have one goal and that is to look for the act or talent that is worthy of the prize that they are bound to give. A man named Alexandr Magal proved to the judges of the Britain's Got Talent that he is ready to risk his life just to prove to the world that he is worthy of the prize and fame from the show. This man is really out of his mind. He started swallowing the sword and did several backflips. The reaction of the judges and the audience could not be explained. Just when they thought that it was finally over, Alexandr grabbed a longer sword and ingested it. He then climbed to the top of the pole and hung himself upside down. He dropped himself and just a little bit more and his life will be spared. The good thing is that he has a great control over himself. This is sure an act that is hard to swallow.